dawson college shooting | doberman pizza. 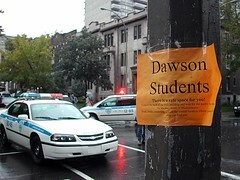 at this point, few details about the recent shooting at Dawson College in Montreal have been released. someone, apparently a 25-year-old white male armed with a machine gun, approached the front steps of the College and began shooting—indiscriminately, it appears. the shooter entered the college, moved through the atrium, and into the cafeteria. eyewitnesses have been telling their stories; so far, at least one of them has blogged what he saw while the shooting was taking place. You can follow the story by checking with CBC / Radio-Canada. The French content is being updated quicker than the English in this case, so I recommend Radio-Canada for best results. See their in-depth coverage. 20 people were reported injured. As of midnight, two deaths were confirmed; the shooter as well as an 18-year-old woman. Once I began to read about the story I just got so sad, angry, incensed. I suppose it hit home because I have connections to Montreal; I was born there, I’ve spent some time there, and I have friends there. But it affects me on a human level as well, and it frustrates me to see people flip out like the Dawson College shooter did. Weirdly, I feel like I can empathize with everybody in this story—the victims who had to endure this horribly traumatic experience; the families who were worried to death that something terrible had happened to someone dear to them; and yes, even the shooter, who appeared (from what little we know) to have been so badly traumatized, wounded or deprived during his life that he decided to inflict his pain on others. It makes me angry both that someone would choose to do such a callous, atrocious, cruel and senseless thing, and that the family, the community, the society and the world he lived in seems to have been so unable to provide the support, the fellowship, and the education he may have needed to learn how to live and act in accordance with his own nobility as a human being and to reflect divine qualities and attributes, rather than abasing and degrading himself with conduct that not even animals would engage in. Sorry. I don’t make a habit of posting rants. Prayers are in order for all those involved—prayers for physical, mental, emotional, and spiritual healing. Also, prayers for unity are in order. I feel that one of the most fundamental reasons why tragedies like this happen is lack of unity. we all know the world is in trouble and needs help, but it seems like nobody can—or will—agree on what to do about it. as long as we come to the discussion table with our hidden agendas and vested interests, as long as we fight each other trying to prove each other wrong instead of working together to investigate and understand the truth, as long as we mistrust one another and set ourselves apart from others, tragedy upon tragedy will keep dogging us like the waves of a slowly rising sea. without unity, no social progress is possible; the longer we quibble, the more people will hurt. This entry was posted in baha'i blog, by the way..., journal and tagged montreal, news, reflections, unity, violence by danger. Bookmark the permalink. This is really quite shocking, thanks for the quote from Abdul-Baha it’s a such a nice one.